When Nathan and I began talking of marriage, I started to understand the real possibility of him being called to full-time vocational ministry. Of course, I figured it would be many years in the future. I was only a semester into college when we married January 2013. While I didn’t enjoy school, I knew I would be finishing one way or the other. I just tried to accept it. A few months into marriage Nathan was just finishing a fast and God had planted the thought in both of our minds that vocational ministry may be closer than we originally thought. So we began seeking opportunities for Nathan. After a year of interview processes with a few churches and no job offer, we thought Kearney was where God wanted us for now. In May, Nathan began a full-time job to replace his two part-time jobs to make our life a little more liveable. I had worked hard taking several summer classes and was set to graduate summer 2015. Everything looked good! We were content. Then we got the email. A church emailed Nathan saying their application process had gotten delayed and wanted to check if he was still interested. No big deal, we said yes. Soon after Nathan had a phone interview. Nothing new for us, plenty of short interviews before. Then he was asked to do a Skype interview. Okay, one step at a time, we have been through this before. Filled out personality tests, sent doctrinal statement, a few other things. We find out we were one of two remaining candidates. Still this doesn’t mean anything. We have been close before. Each time we were pointed back to Kearney. Then something new: a soft visit with the possibility of a candidating weekend. Wow. Okay… is this really happening? Is God really sending us somewhere else? An 11 hour car ride and we arrived for the first time in Devils Lake, ND. A weekend spent with some of the church and we were invited back 2 weeks later to candidate. That weekend could not come fast enough. Our life was up in the air. No plans could be made too far in the future without alternatives. After being welcomed by the church and drilled with questions (okay, Nathan was drilled I was only asked a few totally off topic questions), the congregation voted and we were given a call letter. WOW! Is this really happening? I had finally accepted living in Kearney and finishing college in a year. What does this mean for me? And then it hit me, why am I thinking about ME? My life is not about me. My life is God’s. I am only here for his glory. Apparently I am supposed to be in North Dakota glorifying him. He is in control. So now I am trying, with the Spirit’s help, to align myself with God’s plan. I am to be a youth pastor’s wife. As usual God has worked all the little details out. My major is beginning to offer almost all classes online so I can still finish at my current college. It just might take the usual 4 years. We had to break our lease a month early, but a new tenant will be moving in so we don’t have to pay rent twice. We found an apartment that is available the day we arrive. We already have a hotel booked super cheap for Courtney’s wedding we will have to come back for in October. So many other details are getting taken care of! I am learning to release my worry. Thursday we pack our U-Haul and Friday we leave the state! North Dakota better get prepared for a California boy and a Nebraska girl! All moved out or all moved in? I’m officially moved out of my apartment and into a storage unit! It only took two weekends, a total of 8 helpers, 6 cars/trucks and a whole lot of patience. 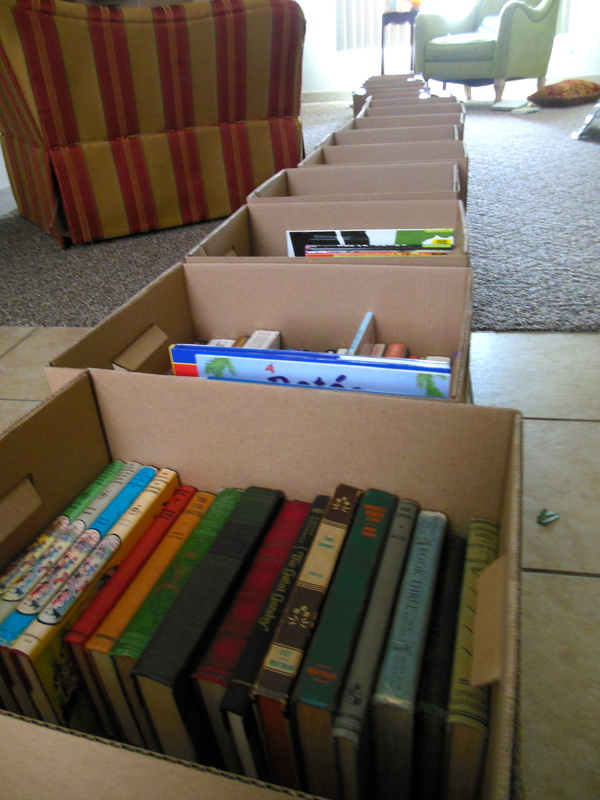 I am very thankful for all the help I received, especially since the amount of book boxes I ended up with totalled a whopping 16! They are now safely located in my storage unit on top of a table and neatly catalogued for easy access to be used by friends and family while I am away. It’s pretty crazy to think that my entire apartment now resides within a 10 x 20′ space. It fits comfortably too – enough that we joked that I could just sleep there instead of the Clarks’. Thankfully, I am also moved into the Clarks’ nicely air-conditioned basement for the month of May – much better living conditions than the storage unit! Now I need to start packing for Argentina… any suggestions on how to pack for a two month stay in a foreign country? 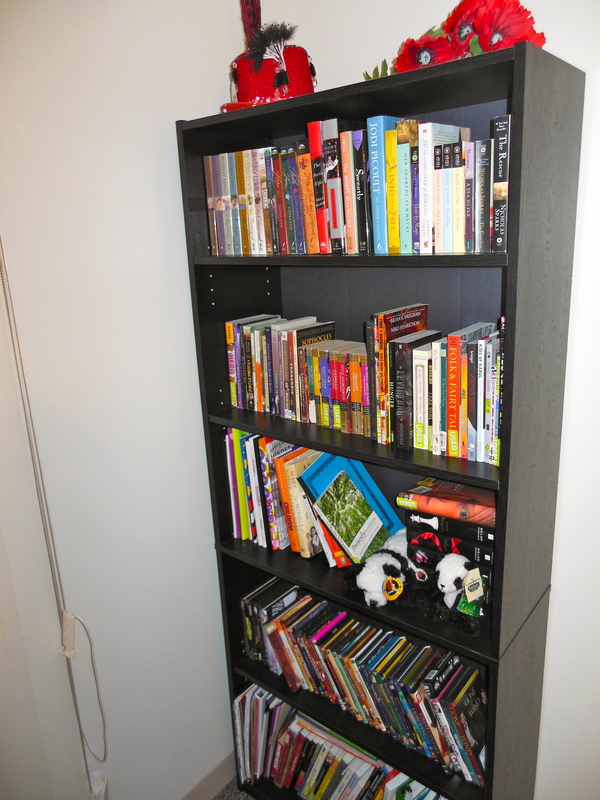 Project Bookshelf – Time to pack! So it may just be the stage of life I’m in, but I always seem to be moving. Since starting college in 2009, I’ve moved somewhere around 8 or 9 times (including in and out of the dorms at the beginning/ends of years). I have one semester of college of left, and I’m moving one more time! This time is a little different though. Instead of moving to another apartment, I will be moving all that my apartment contains to a storage unit. Because my Argentina trip is filling 2 months of my summer, there is no need for an apartment over the next few months. Then in the fall I will be living with the Clark family, and therefore I won’t be needing my furniture. It’s a weird feeling trying to basically pack my life away for the next 6 months or so of my life, but also kind of exciting. 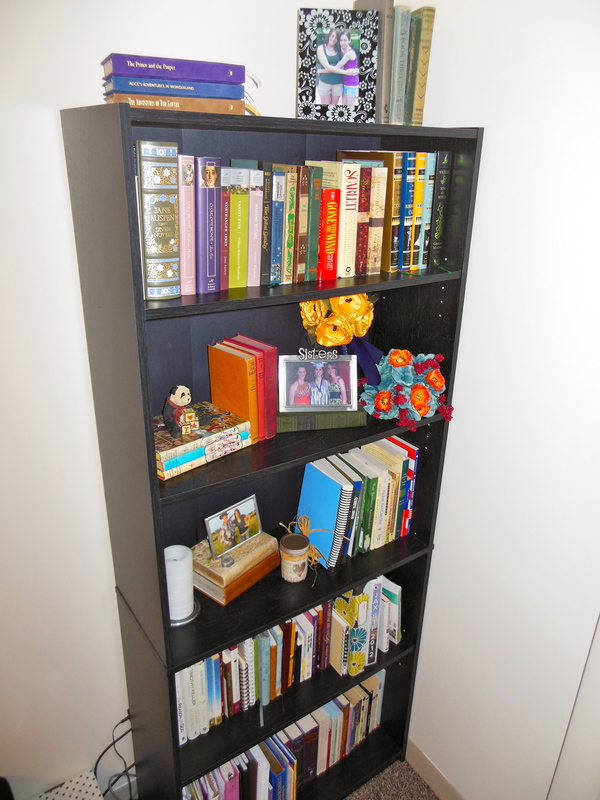 Not only do I get to purge the nonessential items from my life, but it is also an opportunity to organize! However, I’m most broken up over the need to pack ALL of my book collection, which may have gotten out of hand in recent years since moving to an apartment and buying/filling two bookcases. However, I am also probably the most excited over the chance to organize and catalogue my books while packing! 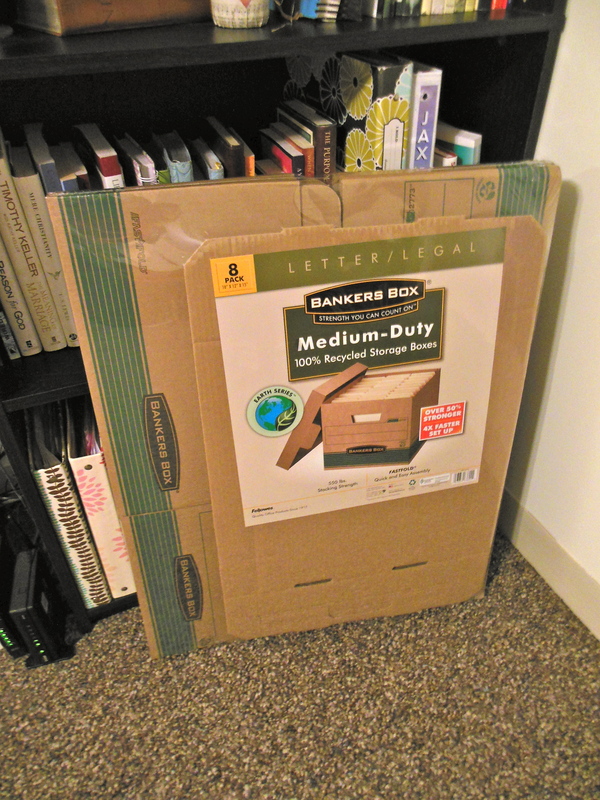 Mom and Dad were kind enough to pick up some smaller cardboard filing boxes to prevent broken backs during the move, so this week I’m tackling “Project Bookshelf” and tearfully retiring my books to their new homes for the foreseeable future. I will keep you updated with the final outcome of how many of the 8 boxes I use… did I mention that my parents have opted out of this move? For some reason they aren’t enthused about the heavy lifting. Thankfully, some very lovely friends of mine have agreed to help with the job and may be rewarded with baked goods! Do you have any hints or tips for packing not simply to move but to move to a storage unit? I’d love the help of those more experienced than me! The last few days I have been living the life of a pack rat. Yes it’s that time again – time to pack up and move. You would think that I would be a pro at this by now (since I have moved 6 times since coming to college). But alas, I have not refined packing to an exact science or art. 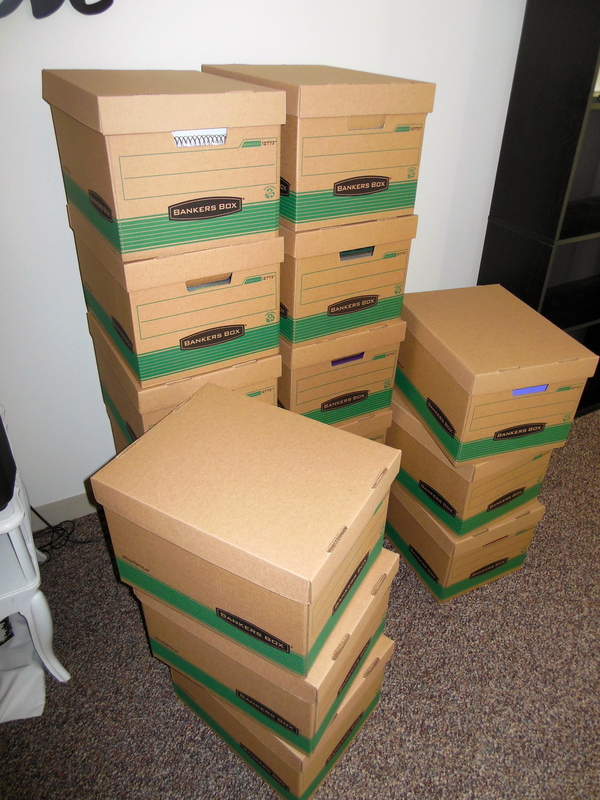 More or less I toss things into a box until its full – which makes for quick packing. However, when you are unpacking those unmarked boxes with the intention of finding a very specific item it’s almost impossible! There’s a saying that things often get worse before they get better…whoever coined that phrase must have been packing to move. My room this week is proof of that! I would take a picture but my camera is somewhere in my room under a pile that is yet to be picked up and packed! Ha!